← Why do writers spend money? Superman? Not without a super woman. 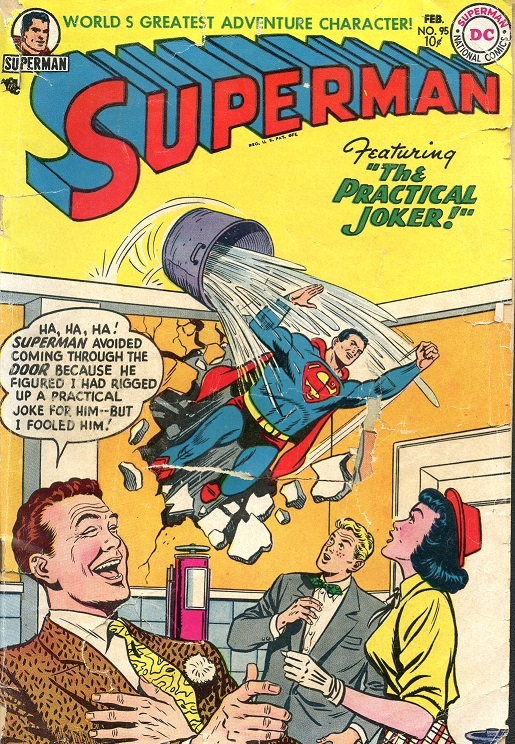 In February, 1955, the Superman comic book cost ten cents. That month, the back page carried an ad for Fashion Frocks. The headline read; If you get a Stunning $10.98 Dress Without Paying 1¢…will you WEAR and SHOW it in your community? It was like Tupperware marketing—without the parties. 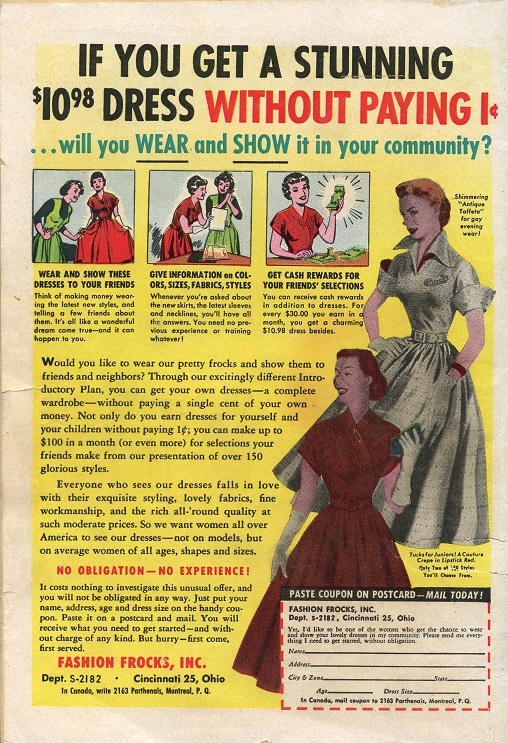 That ad clearly indicated that Fashion Frocks, Inc. believed that girls were reading the Superman comic book, and yet, National Comics (later known as DC Comics), opted to keep their female employees hidden from their readership. In that same issue, right smack in the middle, there is a two-page article called, The Saga of the Soda: America’s Fountain Favorite Has Had a Remarkable Career, written by Ben Boltson. Only it wasn’t. It was written by Barbara Boltson, my mother. She was in her early twenties and not yet married. Despite the saccharine title, the article was not pure fluff. I don’t mean to imbue it with undeserved gravitas, but she had to have done some research in order to be able to explain the science behind carbonated water, as well as how to capture and deliver it for use at soda fountains. Fluff or not, it makes me sad to think that she had to forego her just deserts because National Comics wouldn’t allow women to publish under their own names. After my parents married (which presumably would have caused my mother to be called Ben Mintz had she continued to work for National Comics), they moved to California and for a short time she worked for Western Family magazine where part of her job was delivering models to photo shoots. (She’ll blush to read this, but I remember a story about her car breaking down and the tow truck guy who came to help telling her that he had once towed Elizabeth Taylor and that Mom was prettier.) I have no doubt that if my mother had been born a few years later she would have had a marvelous career managing a magazine, or working as a writer or editor, but once she had her children, that no longer seemed to be an option. And then, in the early 80s, I gave my mother a Commodore 64 computer. 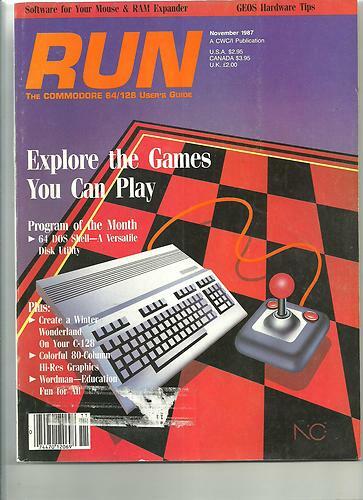 It was love at first sight, and before long she was running the Commodore Users Group of the Boston Computer Society and writing articles for RUN Magazine. She may not have worked outside the house, but she was a hell of a role model. I have great admiration for my dad, and he’s always been one of my heroes, but if I needed someone to leap a tall building, Mom was the one I’d ask. She is modest to a fault and may well be embarrassed by all this attention, but from the first time I saw that Superman comic book with my mother’s pseudonymous byline, I knew I wanted to grow up to be like her. Things change; magazines no longer cost a dime, and women publish under their own names, but I continue to get inspiration from my mother. This entry was posted in Uncategorized and tagged Boston Computer Society, Commodore 64, Commodore 64 Users Group, DC Comics, Fashion Frocks, mom, National Comics, Run Magazine, Superman. Bookmark the permalink. The things you don’t know about people, right? Good work, Judy–most of us fail to do this, i.e., let the people we admire know it. I failed my mother in this regard but did manage to get off a few letters to teachers who deserved praise and probably got little of it. Most notably, my Latin teacher at Medford High School, Miss Ladd, who was the first teacher I ever had who had really high standards and who made sure we met her expectations. Years down the road, I still think of her positive influence. Judy! You are amazing writer…and family historian. Your entry about your mother was not only one filled with admiration and inspiration…but it was “news” to me! How wonderful that you’re able to share your stories. Makes me proud! I’m so glad you visited my blog. There are family stories sprinkled throughout, but you might have to dig to find them. Off the top of my head, one that mentions Uncle Howard is here: https://judymintz.com/2011/08/16/not-just-for-kids/ Do stop by again.